Coming from a casual Precure fan (at this time I've only seen Heartcatch and most of Hugtto) this movie is just fine. The first half is entirely hand-drawn animation, and primarily focuses on the Hugtto and Futari Wa Precure casts. It gives off a similar vibe to Hugtto itself, so if you're a fan of the series, you'll probably enjoy this just to see the characters you like again, and in a new context (that being that most of them are turned into babies for a short while). The second half switches to full CG animation, which while not looking extremely impressive, given just how much action is portrayed in this second half, along with the fact that it brings in every(!) Precure from past seasons to do an attack or two, it's likely we wouldn't have got such a blowout without resorting to this, and all things considered, they use the models and camera movements in a dynamic enough way that the action is still satisfying throughout, with some fun character moments thrown in for good measure. The plot is nothing to write home about, but it gets the job done. If you're watching this movie, it should be to see all the Precure in a single movie, or at the very least, to see the Hugtto/Futari Wa casts a bit more (beyond those two, the other Precure mostly just show up for a minute or two to do an attack then fade into the background). The fact that this is a children's movie becomes quite apparent at a few specific moments where the audience is literally instructed to cheer the Precure on with an item that was handed out in Japanese theaters, which could put some people off given that's not how anybody is going to be watching the movie at this point, but I honestly found that element charming in spite of how cheesy it was. 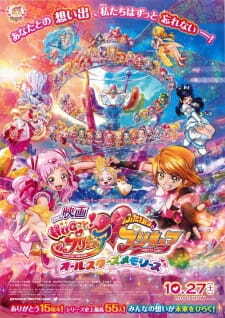 All in all, if you just like the Precure characters and want to see some fun moments with them along with some pretty cool action, and don't mind a barebones plot and half of the movie switching to a CG artstyle, this is easy to recommend as something quick and easy to throw on and have a good time with (it's only about 75 minutes long). The more Precure you've seen the more inclined you'll be to enjoy this, but even as a casual fan, I found a lot of simple fun in it.